*Package does not include movie or DVD/Blue Ray player as most people have their own or use a different device. A Blue Ray player may be rented from us for an additional $20. 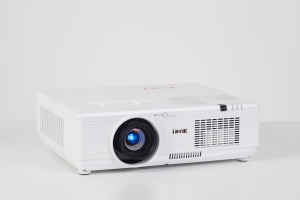 In order to perfectly fill the screen, the LC-WNS3200 projector will need to be placed between 12.6′ and 15.2′ away from the screen. The closer, the better. 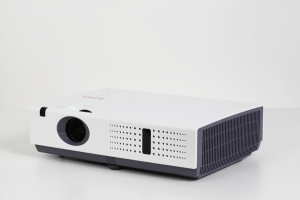 In order to perfectly fill the screen, the LC-WBS500 projector will need to be placed between 12.9′ and 21.5′ from the screen. The closer, the better. Outdoor movies will only really work in the evening after the sun as gone down. Even with very bright projectors, sunlight will wash away any images from a projector. 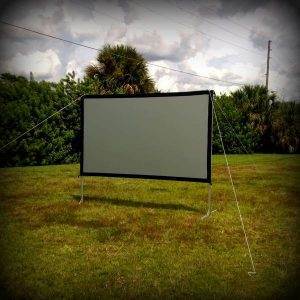 While these are outdoor movie packages, unfortunately, the equipment cannot get wet and needs to stay dry. Prior to setting up, please check the rain forecast and ensure all irrigation systems are off. If you have not yet picked up your outdoor movie rental and need to cancel due to weather, we will not penalize or charge you. If we can answer any questions you may have, or if you would like to reserve a rental, please call us at 407-898-8841.